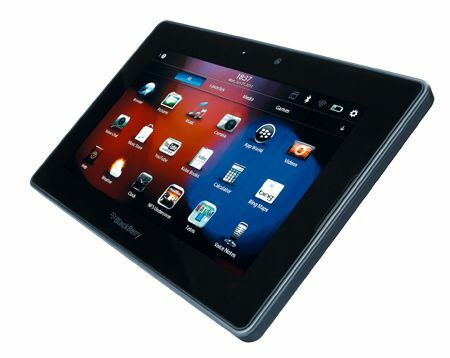 Blackberry PlayBook review | What Hi-Fi? While Android and iOS are the big movers of late, BlackBerry is a key player. The company's first tablet looks to build on its impressive, smartphone-based reputation. Feeling solid with a matt finish, the PlayBook is a robust, more portable device than most rivals. The PlayBook's 7in, 1024 x 600 display stands out, too. The capacitive, multi-touch screen responds to swipes and pinches and even brings its border into play: swipe up from the bottom edge or down from the top to issue commands to the smart, fast OS. Another USP is that apps update even when you're looking at another window – true multitasking. The battery drained quicker than others, though, lasting around 6-7 hours. The browser is excellent: it's fast, with Flash support and intuitive page rendering. It needs to be, too, because you'll use it a lot. The AppWorld store is fairly limited (but does have Facebook, plus lots of games), so the icons (say, for Twitter) instead open the web page. There's no mail app either (odd, given the company's smartphone heritage), so icons for Gmail and Hotmail take you online. As a wi-fi-only device, the reliance on the browser isn't ideal if you're out and about. Our review sample also seemed to need prompting to connect to a saved wi-fi network. The 7Digital-backed music store is a real bonus, but sadly there's no video equivalent. Find your own (a variety of files are supported), or you can play 1080p vids via HDMI. There are two HD cameras, too. Performance is good. The smaller screen has a natural advantage but edges are sharp and there's good contrast. Music is fine too, being hard to split from the Android legion (although it isn't quite as involving as the iPad 2). This tablet is a fine addition to the family. With top-notch user experience, it deserves to win over new and old BlackBerry fans alike.